Thank you and well done to everyone who took part in the second Bo'ness Fun Run, which took place on 14th June 2017. 137 runners took part in the 4 mile track around Bo'ness foreshore, a route which featured the Kinneil Local Nature Reserve, Bo'ness Harbour, wildflower meadows and stunning views across the Forth. The foreshore and the nearby area is the site of six IFLI projects, including creating the wildflower meadows, making local woodlands better for wildlife and people, improving access, and making sure the historic Kinneil Estate Church is preserved for the future. Prizes, made specially by Susan Wade-French at Bean Row Pottery, were awarded to the top three male and top three female runners, and you can see the full list of results and times here. The Fun Run was only made possible with the help and support of many volunteers, local businesses and organisations. Our thanks to Falkirk Council, Falkirk Community Trust, The Friends of Kinneil Foreshore Group, Bo'ness Chiropractic and Sports Massage, Bo'ness Rugby Club, the Boys Brigade, and all the volunteers who have so generously given their time and support. 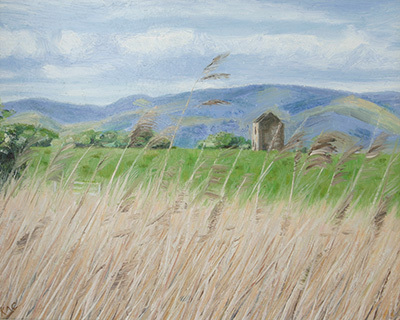 Tower and the Ochils from Skinflats, by Katherine Cowtan. IFLI has recently launched a new virtual gallery to showcase the rich heritage of the Inner Forth, and we are looking for local artists and photographers to help fill it. There are four categories in the gallery - wildlife; landscape; people; and built heritage, which together emcompass the spectacular and fascinating Inner Forth landscape, and its rich natural, cultural and historic heritage. This May sees the end of Fruitful Communities, and a series of events across the Inner Forth will ensure the work of the project continues to bloom. Led by the Forth Valley Orchard Initiative, Fruitful Communities has been working with local people to help them get the necessary skills, knowledge and experience to maintain the orchard resource of the Inner Forth in the long-term. On Saturday 13 May Kennentpans Distillery will host the Family Tree Blossoming Day (follow the link to book) in the plum orchard there, and will include craft activities, Citizen Science guides, an Orchardeering Quiz Trail, and time to explore the space and enjoy the views of the Forth that it offers. This is followed on the Sunday by a family fun day at Riverside Community Orchard, which will also have the Quiz Trail, as well as a photo competition and various craft activities. There is no need to book for this event, which takes place 11:30am - 3:00pm. The weekend caps off a full week of events around the Inner Forth, where FVOI will have worked with school children on a whole host of fun activities designed to connect them with their local orchards. You can find out about the full range of events here. Fruitful Communities is an IFLI project intended to expand on the work as part of the Fruitful Landscape project. The Forth Valley Orchard Initiative is part of the Forth Environment Link. 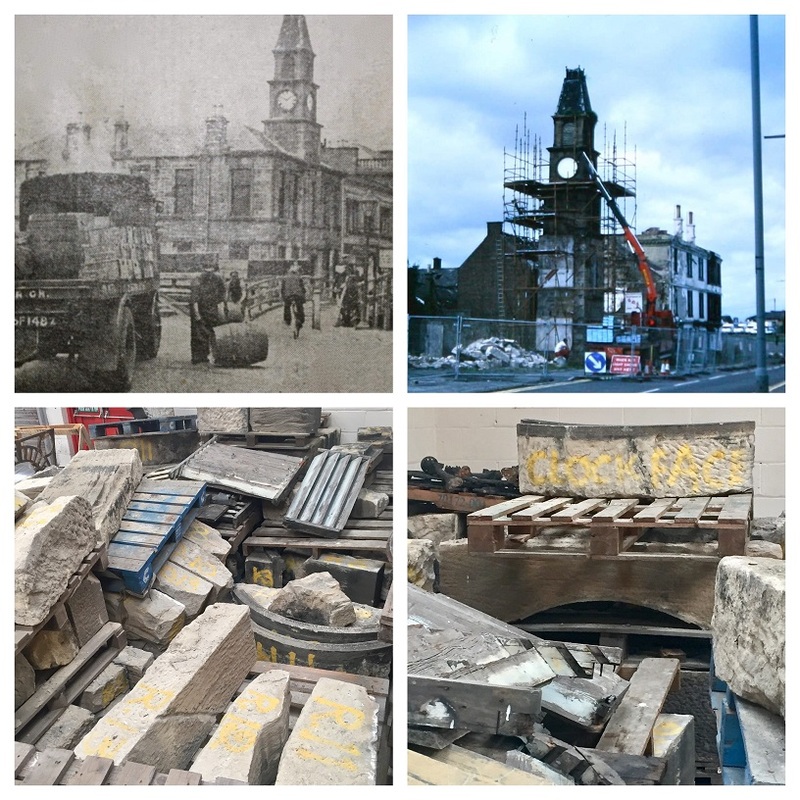 The first weekend in May will see a range of community events taking place at Zetland Park in Grangemouth, centred around the digital reconstruction of the historic town clock tower. The clock tower was disassembled after the Old Town Chambers was destroyed in a fire and has since been kept in storage. To enchance its chances of being rebuilt, IFLI will be working with AOC Archaeology, Falkirk Council and a number of community groups (including EARL, Friends of Zetland Park and Grangemouth Heritage Trust). We'll be bringing the pieces of the clock to Zetland Park over the weekend of 6 and 7 may to allow them to digitally scanned, photographed and archived. This will then go to creating a 3D model of how the tower should be reconstructed. This will form an important part of a future bid to secure funding for the wider regeneration of the Park itself, and will give volunteers a chance to be part of an exciting and unique project, as well as gaining a variety of hands-on experiences in photography, restoration and digital cataloguing. All the spaces for volunteers on the day are now fully booked, but everyone is very welcome to come down to the park and find out more about the restoration. And that's not all - between 11:00am and 3:00pm on Sunday 7th May the Friends of Zetland Park will be hosting a community networking event. Come along to find out more about what's going on in your local area; there will be lots of fun activities at the stalls as well as face-painting and wildlife ID walks. 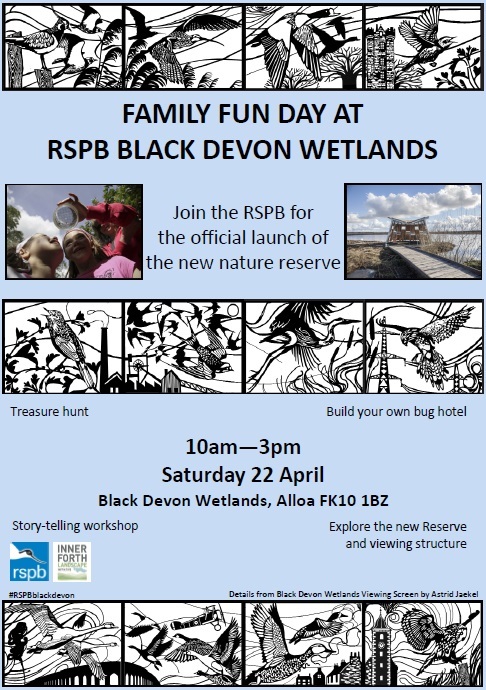 Join IFLI and the RSPB for a day of family fun to celebrate the launch of the new Nature Reserve Black Devon Wetlands in Alloa. Saturday 22 April will see a whole range of great events for kids - a story-telling workshop, bug hotel-building and hunts, a scavenger hunt, and the chance to explore the new site and viewing structure. There will be the oppurtunity to learn more about what makes this site an important part of the Inner Forth landscape. The family fun day takes place 10am-3pm, and is free of charge. There is no need to book, so you can just head along at any time through the day. Since the RSPB took over the lease for the Clackmannanshire wetland site in 2015 they have been working not only to improve the natural habitat for wildlife, but also to make the area a vital resource for the local community. Even if you can't make it on the 22nd, the Wetlands are free to access at any time. For more information on the site and what wildlife you can find there please visit the RSPB website. By train: Alloa train station is approximately 2.5km away. From the A907 take Auld Brig Road. At the roundabout take the second exit onto Greenside Street. Turn left into Broad Street. Turn left on to Bowhouse Road. 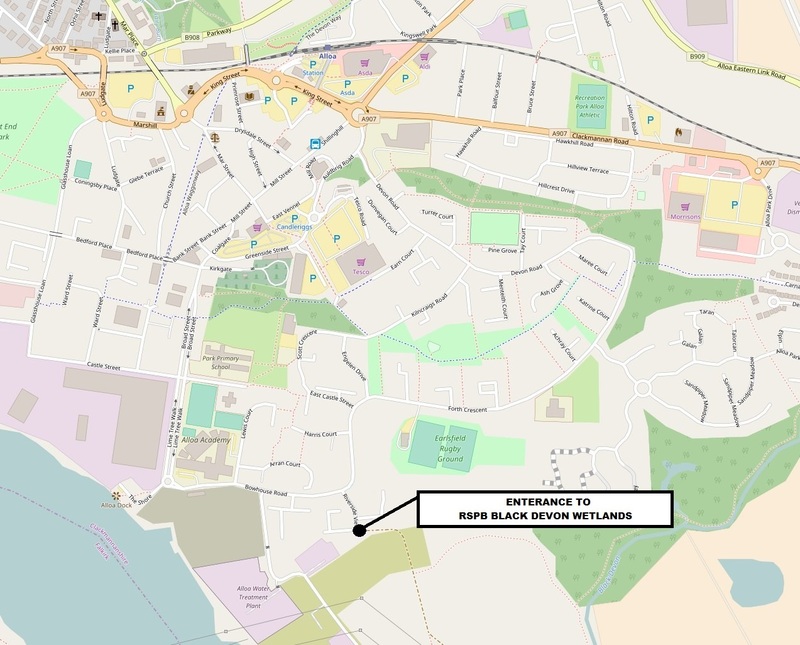 Turn left onto Riverside View, the reserve can be reach via the public footpath at the end of Riverside View. By bus: The nearest bus stop is on Bowhouse Road, this is on the Tillicoutry to Glenochil route (C2). From the stop, turn into Riverside View and take the public footpath at the end of Riverside View. By road: From the A907 take the Auld Brig Road, at the roundabout take the second exit onto Greenside Street. Turn left into Broad Street. Turn left onto Bowhouse Road. There is currently no designated parking for the reserve but there is limited parking in the small car park at the junction of the Bowhouse Road and Riverside View. The postcode for sat-navs is FK10 1BZ. This is a residential area, so please park responsibly. There are several larger car parks in Alloa town centre including Candleriggs and Ring-Road East car parks which are only short walks from the Wetlands entrance.